Laugarbrekka is the birthplace of Guðríður Þorbjarnardóttir, the wife of Þorfinnur karlsefni. 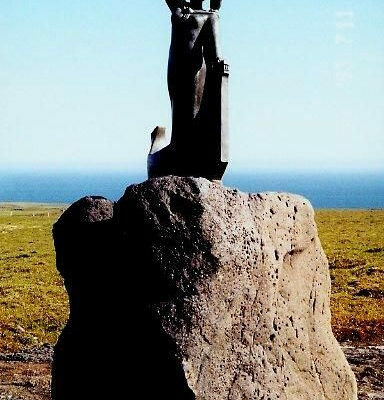 They attempted to settle in Vínland in the year 1004 and Guðríður gave birth to the first white child to be born in America, Snorri Þorfinnsson. Guðríður was one of the greatest travellers of medieval times, walking all the way to Rome, among other things. She eventually settled down at Glaumbær in Skagafjörður (see Road 75). Most Icelanders are thought to be able to trace their ancestry to her.